Battleship HMS Vanguard in 1951. Photo from dad's photo albums. Battleship HMS Vanguard in 1952. Photo from dad's photo albums. HMS Gambia, Vanguard and two submarines, Gibraltar, 1952. Photo from dad's photo albums. HMS Wrangler ~ Tobermory Bay, Mull. This is the ship that dad trained in, so the photo must have been taken in 1949 / 1950. Photo from dad's photo albums. 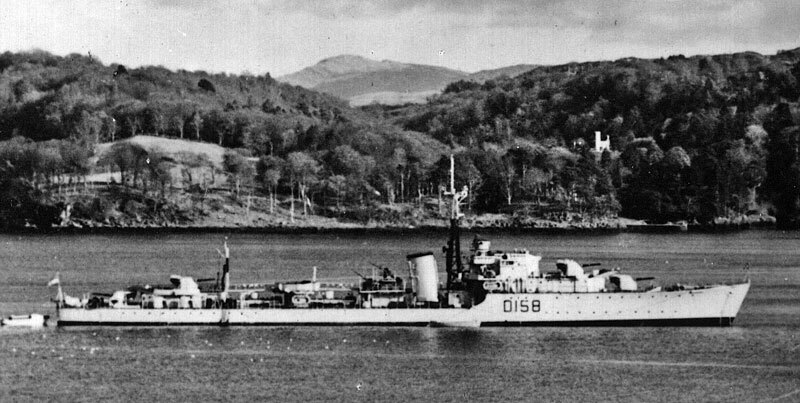 Both the pictures, above and below, are labelled in the albums as HMS Wrangler - but one has the pennat number D158 and the other R48. I had no idea why this should be, but I received an email from Tom Spowart who served in the Canadian Royal Navy which probably explains it. "The photos give me impression it was a "V" class destroyer and at the closing of World War II Canada received two such ships from the Royal Navy, HMS Vixen, pennant number R64 and HMS Valentine pennant number R17. After major refits, Vixen was subsequently renamed as HMCS Sioux with pennant number 225 and Valentine became HMCS Algonquin pennant number 224. I served on the Sioux during the early 1950's. 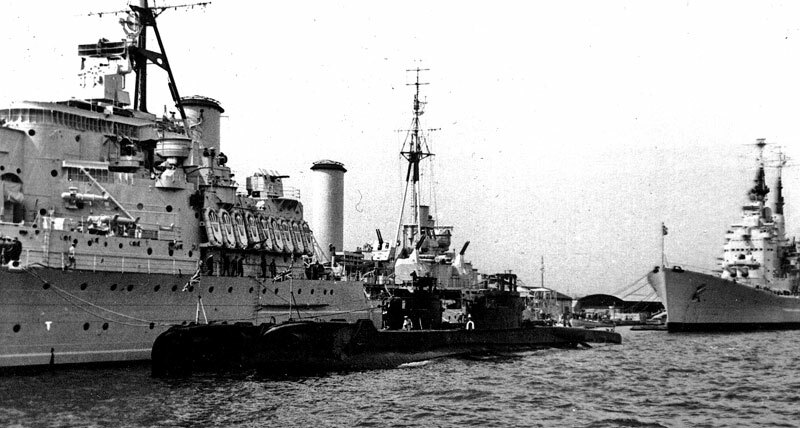 It is quite possible that all "V" class British ships had an "R" pennant number and possible later changed them as they had refits which may have redesignated them as different classes of destroyers." HMS Wrangler. Photo from dad's photo albums. 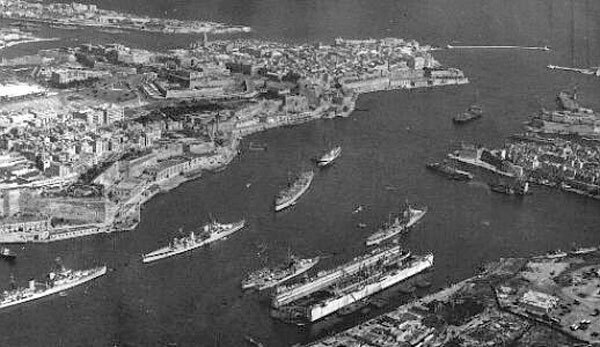 Grand Harbour, Valletta, Malta, 1955. Photo from Ray Holden. Ray Holden sent me this photo in January 2002. He writes "The 1st Cruiser Squadron used to tie up on the far side. This picture was taken in 1955 when Sheffield was flagship, that's her second from left. The ship behind is Kenya, this is where Gambia used to tie up behind her flagship which was Liverpool."